for maximum OC potential and great for both AMD & Intel !! The new high-end Dark Pro Series memory kits in the special "8Pack Edition" have been developed and tweaked with the help of overclocking icon Ian "8Pack" Parry and the renowned graphics card expert Andrew "Gibbo" Gibson. The dual- and quad-channel kits have been developed in cooperation with Team Group, Caseking and Overclockers UK in accordance with strict quality, performance and compatibility criteria. Samsung B-dies are used exclusively by the 8Pack Team due to their superb compatibility and overclocking potential, especially when paired with the latest Intel Kaby Lake (Z170/Z270) and AMD Ryzen platforms (B350/X370). The aggressive latencies out of the box of CAS 14-14-14-31 as well as their high overclocking potential mean that these kits have been designed from the ground up for enthusiast-level gaming and overclocking. Attainable frequencies extend to over 4000 MHz on the X299 platform and up to 3600 MHz on Ryzen systems with moderate latencies. But even in regards to latency tuning the Dark Pro "8Pack Edition" RAM kits are very flexible. This is what allows hassle-free CAS10 timings with lower memory clock frequencies. The modules are equipped with massive black anodised aluminium heatspreaders in a sandwich-style design. This, in conjunction with the titanium-coloured centre and the notches, allows for a sleek and premium aesthetic design. The total height of the range is approximately 45,6 mm and should be kept in mind when choosing a CPU cooler. The heat dissipation capacity of the Dark Pro series is also especially high, meaning that they have plenty of cooling capacity spare during overclocking. Furthermore the PCB cover of the heatspreader can be removed, which reduces the total height to just 37 mm and markedly increases compatibility with larger CPU coolers. More links for "Team Group Dark Pro " Edition" 16GB (2x8GB) DDR4 PC4-25600C14 3200MHz Dual Channel Kit - Black/"
Nice understated aesthetics and performance that is best in class for these speeds. Put this on offer again and I will be buying a second set for sure! cmon overclockers! This is good RAM fast and overclocks well. Delivery was fast and no fuss, only reason for not giving this a 10 is a problem with the website, but this was sorted by the overclockers staff. Hey Chris, apologies for the website issues, it's been all fixed - we're glad we could still help with your order! Black Friday not the cheapest. Great RAM. Bought for £149.99 in April 2018. Check your prices and don't overpay. Best RAM ever, totally amazing! Just got a set of these to go with my Ryzen 2700X, worked flawlessly using XMP so thought I'd try a bit of tweaking so using the Ryzen Dram calculator currently have them at 3466mhz 14,14,14,14,28,42 and stable as a rock, absolutely amazing. Bought these to replace another set of Team Group RAM I had that was lower speed and had looser timings. Using them with a R5 1600, the XMP/DOCP works flawlessly on 3200mhz, though I've used three different sets of RAM and never had any issues with that. The performance uplift however is definitely real. With the memory on 3200mhz and the CPU at 3.8Ghz, I'm matching my Cinebench scores previously from running with 2933mhz RAM and 3.9Ghz on the CPU in single and multithreaded runs. They also look great, no RGB required. They've got a classy and understated look to them which fits perfectly with the rest of my PC. I bought these to go with a X370 MSI Gaming Titanium X motherboard and a Ryzen 1800x. After updating the bios to the newest version and setting the rams default xmp profile in the bios, it booted to 3200MHZ first try. Overall I am very happy with it. Simply the best ram I've ever had. Simply enabled XMP in bios (Asus b350-f strix) and the work was done. All advertised timings and voltages set and running at 3200mhz.Nice! Worked perfectly at 3200MHZ for a Ryzen 1700 system, no problems at all. Used this memory with my Ryzen 7 1700 and Gigabyte AMD Ryzen AM4 AX370 GAMING K3 motherboard. Timings weren't correct to start and kept rebooting the system every 5 times then a auto bios reset occurred. After the system reset the bios, the system then booted at a lower frequency and timings. I then went to the bios and changed the timings manually that was stated for this memory but still running at a lower frequency. All was fine without the reboot loop and I was then able to install Windows 10. After Windows 10 was installed, I downloaded the latest bios and copied it to a pen drive and flashed the latest bios version. After this, I then enabled XMP profile and used auto timings in the motherboard. System booted straight away without any errors at the stated speed and timings for the memory. Hope this helps anyone with the same board thinking about getting this memory. So far I am very happy with how they perform. Would recommend them and when I need another 16gb I will choose these. Fantastic bit of kit. You pay the premium for guaranteed B-Die Ram but its well worth the money. Got it working 3200nhz using the XMP profile straight out of the box on my Ryzen 1700 / ASrock AB350M combo. Bought for a Ryzen 1700 system, works flawlessly at 3200mhz without any problems. Worked out of the box 3200mhz no messing about. This is what we want! Having never spent so much on memory before I wasn't going to be happy with anything less than a tip top product. Thankfully everything about them oozes quality from the packaging to the well built solid sticks. I had no problem booting them up on my M-ATX Ryzen 5 build either so they're hard to fault. If I had to buy more memory these would be my first, second and third choice. I bought two sets for a Ryzen threadripper 1920x system giving 32GB quad channel. Set XMP in the bios and they worked perfectly with no need for further adjustment. With some tweaking it's been possible to run them with even tighter timings which has given a nice boost in performance. (14-13-13-13-26-42-256-1T) It's also possible to run them at 3333MHz with slightly slacker timings too. The processor memory controller obviously has an effect on how much mileage you can achieve beyond box specs. OMFG ! !What is this ram?? amazing.. Guys stop buying wrong Modules just buy this one.. Best ram i ever tested in my life!! Works flawlessly on a mATX Ryzen system. Have only tried a little bit of overclocking and haven't tried overclocking the RAM yet, but it's perfectly stable @3200mhz with a Ryzen 1700 @ 3.95Ghz on a GA-AB350M-Gaming 3 motherboard. Out of the packet into the motherboard (remember to clear CMOS!) and immediately identified as DDR3200, with the tightest timings. Design is slick, yet simple. Packaging (who cares) is well thought out and cool. Having used Corsair LPX 3200 RAM which only ran at 2933 with Ryzen this was a big improvement. On the same CH6 motherboard with the 9920 BIOS this memory runs fine at 3466 c15 with no problems. I appreciate peoples results may vary. Took this kit after buying a regular TG 2x8 for my Ryzen 1600. Powered up on the advertised timing from first time of asking. Recommended for 3200 C14 on Ryzen. 3200 C14 working with 1700@3.9 on Asus B350-F and MSI x370 Gaming Pro Carbon. Enabled XMP only, no other change required. Unable to get stable above 3333 C14 without the usual AM4/Ryzen memory issues. May be possible with sufficient tweaking/patience. Have no doubt this memory will do much better with Ryzen+/Ryzen 2 and next generations of mobos. Or use on Intel, where memory OCing actually works today. Great product, of really easy on my i7 7700k 8pack elite tier of to 5ghz. All it took was bumping up the voltage on the ram. 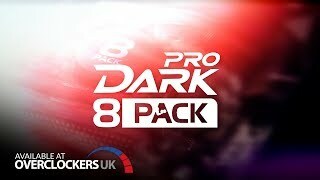 As the DARK Pro '8 Pack Edition' is guaranteed to use Samsung B die ICs, gamers and enthusiasts can both benefit from the gains provided by this attractive, performance orientated memory kit.